San Francisco: The Grand Cherokee has fulfilled its role as a rugged, yet luxurious, family wagon for nearly a decade and a half. Now in its third generation, it adds power to its list of accomplishments. The Grand Cherokee now comes with Chrysler’s popular Hemi V8 engine. There’s nothing quite like having 345 horsepower at your disposal. The two-ton Grand Cherokee rolls down the road with authority and ease. The 5.7-liter mill doesn’t intrude, its job isn’t to show off, but you can feel it working in town and out on the open road. It drinks midrange, 89-octane fuel, which is a break from premium, but it is rated at just 15 city, 20 highway. My actual fuel mileage was 12.4 miles per gallon on my usual mixed freeway / city driving cycle. I expected this number to be a little higher, because Chrysler has promoted its fuel-saving Multi-Displacement System (MDS) in this engine. The MDS deactivates four of the eight cylinders when they aren’t needed. Thanks to modern electronics, this can be done without the driver even being aware of it. If these mileage numbers bother you, you could look into the smaller SUVs on the market with fuel-sipping four-cylinder engines. If you do, though, you won’t enjoy the Jeep Trail Rated muscle. Jeep places that badge on its vehicles to show that they can pass various tough offroad tests. These tests don’t include grocery shopping or kid ferrying, which you can do easily in any ordinary SUV. If you don’t need or want the Hemi engine, your friendly Jeep dealer will gladly sell you the Laredo model, with its 3.7-liter V6. It produces 210 horsepower and 235 lb.-ft. of torque, which will provide decent, if not exhilarating, performance. You will be rewarded with a two miles per gallon improvement and of course a lower price of admission. The Limited model, like my Inferno Red Crystal Pearl test vehicle, comes with a 4.7-liter V8. This engine gives you 235 horsepower and 305 lb.-ft. of torque, a significant boost. You get fuel mileage of 15 City, 20 Highway. Hey that’s the same as the Hemi’s! Maybe that cylinder deactivation system does make a difference! Next up in the Grand Cherokee fleet is the Overland a brand new model for 2006. 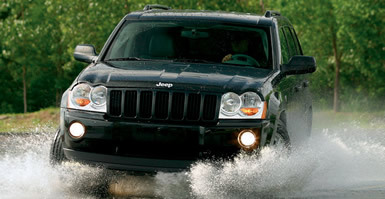 It comes standard with the Hemi, which is optional in the Limited and unavailable in the Laredo. It has bonus features above the well-equipped Limited, such as a real wood steering wheel, more wood on the dash and doors, two-tone leather seats, and standard features that are optional elsewhere. Just out is the new SRT-8 version of the Grand Cherokee. With a 6.1-liter version of the Hemi, it delivers a ground-pounding 425 horsepower through 20-inch wheels. Wow! My Limited tester was extremely comfortable. The seats are soft, like a favorite chair at home, and provide heating and multiple electrical adjustments, including lumbar support. All the usual features you expect in any good vehicle today are there, including power windows and locks, keyless remote, cruise control, and automatic air conditioning with dual controls. Above that, my tester flaunted power adjustable pedals (with memory! ), a premium level Boston Acoustics sound system, RainSense automatic variable wipers, automatically dimming rearview mirror, heated outside mirrors that fold, and much more. Then my tester added about $8,000 worth of options, including the Hemi engine ($845), chrome wheels ($820), and supplemental side airbags ($560). The Customer Preferred Package ($1,900) provided a mix of limited slip differentials front and rear, SIRIUS satellite radio, ParkSense rear parking assist system, and a glass sunroof. There was the Electronic Infotainment system for rear seat passengers ($1,200), and a navigation system ($1,200). It also upgraded the four-wheel-drive system (see below). You can buy a Grand Cherokee with two-wheel-drive, but all models come with four-wheel drive if you want it. There are three different kinds. The Laredo provides Quadra-Trac I, which is completely automatic, with no levers or adjustments to make. A transfer case splits torque 48 percent front, 52 percent rear. The Brake Traction Control System senses tire slippage and modulates the brakes to send torque to wheels with better traction. Grand Cherokees with the 4.7-liter V8 engine get Quadra-Trac II, which uses sensors to determine which tires are slipping and then sends torque to the wheels that aren’t. It uses Throttle Anticipate, which adjusts traction to accommodate quick bursts of acceleration. Quadra-Trac II uses an electronic shift mechanism with a low range, so it’s better suited to offroading than Quadra-Trac I. The top level Jeep 4x4 system is Quadra-Drive II. It adds electronic limited slip differentials to the system. A sophisticated transfer case varies the torque from slip to lock at each axle instantly, giving the maximum traction possible, yet still being usable on everyday dry roads.